‘Grasslands: North America’s Hidden Wilderness’ is a journey through one of the planet’s least known, most beautiful and most endangered ecosystems ­– the Northern Great Plains. When most people think of the prairies, they think of roads stretching on for miles with barely a curve, symmetrical lines of corn, canola and wheat reaching for the horizon. But, just beyond those croplands, there lies an unknown wilderness where a diverse array of life bursts at every scale. The often-surprising wild inhabitants of this land rely on the specific conditions available only in the heartland of the continent. However, the wild prairie is a shadow of its former self. In fact, the grasslands are considered the most endangered – and least protected – ecosystem on the continent. Prior to European settlement, the Great Plains were home to enormous, thundering herds of bison and antelope. Wolves and grizzly bears thrived at the top of the diverse food chain in this vast, unobstructed landscape. It truly was the “Serengeti of the North American continent”. Though much has been lost, there is still enough wildness that exists in these flatlands to inspire awe. Hundreds of thousands of sandhill cranes converge on the Platte River in Nebraska on their northward migration in one of the world’s great wildlife spectacles. 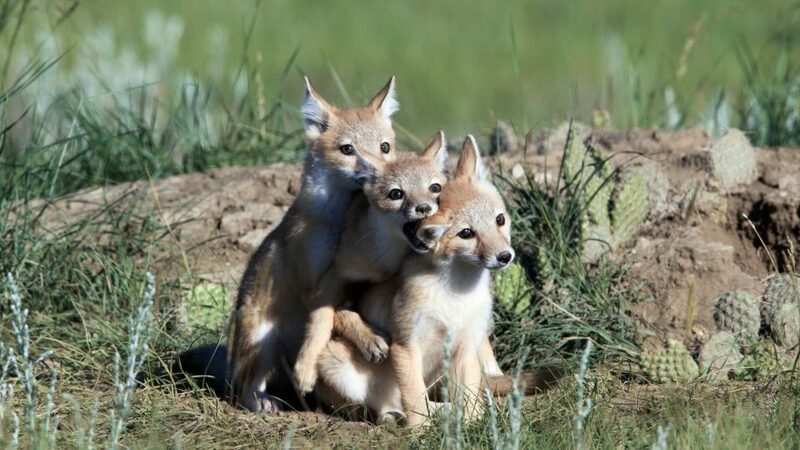 A family of swift foxes – house-cat-sized canids – eke out a living in a summer amongst the sage brush. Pronghorn antelope – one of the last remaining indigenous animals from the Ice Age – learn to navigate the modern, human landscape. Dust is thrown and horns are locked as 2000 pound bull bison clash in battle for the right to breed. And grizzly bears – driven off the landscape in the 1800s – are moving farther back out onto the prairie than ever before. This film is an evocative exploration of a surprising landscape. Featuring never-before-filmed animal behaviour, the film will profile this landscape in a way that audiences have never seen before. It will pair blue-chip wildlife behaviour sequences with various human characters – First Nations, Scientists and Ranchers – who are working on the front lines of unique conservation practices and partnerships to save North America’s remaining wild grasslands.